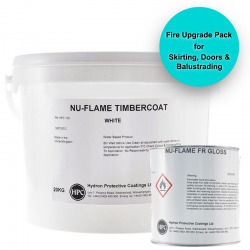 This pack provides sufficient intumescent basecoat (Zeroflame Aquasteel WB+) and coloured topcoat (Zeroflame Aquasteel WB+ Finish) to protect suitably primed, standard structural steel beams and columns in internal environments to 60 minute fire resistance. Zeroflame Aquasteel WB+ 60min System for Steel is a pack that provides sufficient intumescent basecoat (Zeroflame Aquasteel WB+) and coloured topcoat (Zeroflame Aquasteel WB+ Finish) to protect suitably primed, standard structural steel beams and columns in internal environments to 60 minute fire resistance. 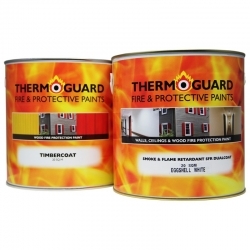 Zeroflame Aquasteel WB+ is an intumescent paint that provides 30 and 60 minutes fire protection on standard steel sizes and profiles - quick & easy application, fast drying times, water based. Zeroflame Aquasteel WB+ is ideal for smaller jobs, easy to use with simplified coverage rates and certificate application. If your steel is bare, after cleaning/preparation mild steel/cast iron should be primed with Rust-Oleum 3369/3380 CombiPrimer Anti-Corrosion and galvanised steel should be primed with Zinsser Bulls Eye 1-2-3. To suitably primed steel, apply 2 coat of Zeroflame Aquasteel WB+ at 1m² per litre (890 microns WFT per coat), allow to dry (usually 4 hours (20°C and 60% RH)). Then apply 1 coat of Zeroflame Aquasteel WB+ Finish at 12-14m² per litre in the chosen colour and finish. 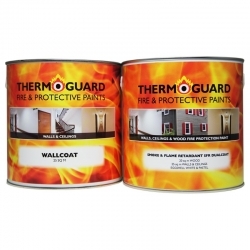 *1 coat of Zeroflame Aquasteel WB+ Finish is normally sufficient but for dark contrasting colours 2 coats may be required. Please note: These packs are NOT suitable for hollow sections, if you have hollow sections to protect please contact our Technical Department on [email protected] or 0113 2455450. Zeroflame Aquasteel WB+ is suitable for all types of structural steel, subject to the minimum steel thicknesses and Hp/A listed in the product data sheet. Please download and read the product data sheets (available below) before use. Each tin has a certificate application form on the back of the label. To receive a 'Certificate of Supply' for your purchase, after application of the product, simply complete the form on the label and send to the stated address and a certificate will be returned to you within 7-10 working days.